Drywall is a beneficial building material in that it goes up quickly, is inexpensive, and it can be used in a variety of ways. However, drywall is also easily damaged. When drywall is cracked, it is important to repair it, not only to improve the look of the wall, but to prevent the crack from expanding. Other times, drywall may have a texture to it. Previous styles of drywall used texture, although this is more commonly found in ceilings. In order to fill in the texture and to bring about a smooth coating, you need to take advantage of a skim coat drywall application. Even if you have never used drywall before, a skim coat drywall application is not difficult, time consuming, or expensive. Once you master it, you'll be able to take your newfound skills and apply them to any other drywall repairs you'll need to make around the property. By following these tips, you'll have everything you need in order to handle all of your skim coat drywall applications. What Do You Need To Skim Coat Drywall? There are a number of items you'll need to pick up before you begin the job. None of the items you need are expensive, so you will be able to pick up everything for just a few dollars. First, you'll want to pick up a drop cloth, or something else you can toss over the floor and nearby objects to avoid spilling drywall on the ground. You'll also want to pick up any cleaning rags, if you don't already have any; drywall primer, and a roller. For improved leverage and a greater application spread, you can pick up a long handle for the roller. This will help speed up the process. You should also consider grabbing some masking tape or painter's tape to apply around the edges of the room where you don't want the drywall to end. You can use the heavier masking tape if it is available. 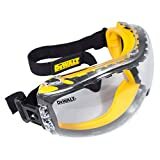 You should also pick up some safety glasses if you do not have any. You will be sanding the drywall, in which case there will be flecks of the drywall in the air, which can sting the eye if it catches. So make sure to protect yourself. For the application of the drywall mud, you will need a thick, heavy-nap roller. You'll also need an all-purpose joint compound and a container to mix it in. To smooth it all out, you'll need a trowel as well. On top of the trowel, use a squeegee knife. This equipment will allow you to apply the skim coat drywall application and smooth it out as you go. You will want to pick up a mud pan for mixing the compound, and you should grab a paint brush for making sure the compound makes it into the cracks and crevices of the corners of your room. You will need sandpaper for the end of the project. If the drywall went on relatively smooth, you should be fine with a 120-grit sandpaper. However, if there are taller valleys and peaks in the drywall application, you might need to pick up 100-grit sandpaper as well. You can pick up everything you'll need for the project at your local home improvement store. Also, consider how much drywall compound you need. The drywall compound will go on thin, and you will not need a ton of it to complete the job. It may be best to purchase a few small containers, instead of one large container. Once opened, the compound is susceptible to drying out, in which case you might be left with a large amount of unusable drywall compound. Instead, it is best to have a few smaller containers. This way, you can save the additional containers for future projects, or just return what you do not use. First, you want to wash the wall. You don't need to deep clean it or anything like that, but make sure you take a damp rag and wipe over the drywall. This will help remove any dirt that has collected. Allow the wall to dry after. As long as the rag is damp and not saturated, it should be dry by the time you finish washing it off. Now that the wall is clean, you need to prime the walls. Pick up a drywall primer from your local home improvement store. The primer will seal in any of the loose bits of drywall, and it will help improve the application of the drywall joint compound that you'll use during the skim coat application. You will roll on the primer just as you would a paint primer, so don't spot prime. Even if you only need to repair a small crack, it is important to apply the primer over the entire surface. First, you'll want to mix your all-purpose joint compound. Different joint compounds have different instructions, so make sure you follow the instructions printed on the side of the label. Some may come pre-mixed, which is fine, although these kinds are usually thicker. Take some mixed compound and place it into a larger bucket or paint trough. Now coat the heavy-nap roller. The roller method will take a bit longer than the professional method, but if you haven't applied a drywall skim before, this is the best way to go. It's fool-proof, so you'll always have a smooth application in the end. Coat your roller and apply the joint compound to a small area of the wall. You'll want to work in sections here in order to avoid the drywall drying before you can smooth it out. Work in areas of around four feet squares or so. Now that you have applied the joint compound to the four foot section, take out your trowel and place the squeegee knife on top of the trowel. Now, run the trowel down the just applied compound, starting at the top and working your way down. This will help smooth the compound out. If the compound cracks on this first application that is fine. While you smooth the compound out, keep a rag around to wipe the blade on every few strokes or so. As mud collects on the blade, it will lead to ripples in the drywall. So clean the blade accordingly. Continue this application in four foot square sections until you have finished the complete application of the full wall. You'll want to let the room dry. If you the air is humid, bring in a dehumidifier or a space heater to help speed up the process. Because the layer is on the thinner side, it shouldn't take more than an hour or two for the entire room to dry out. With the first layer dry, now is time for the second layer of the skim wall drywall application. Much like you did with the first application, work in four square foot sections. After you have applied the drywall, take the trowel and work side to side instead of up and down. This will help fill in any grain or imperfections that might have formed during the previous application. Let the second layer dry and inspect the drywall. If the drywall is smooth, you do not need to apply a third layer of the joint compound. If, however, you see cracks and other imperfections you must apply a third layer. With the third layer, do not use the roller. Instead, trowel on the third layer and allow it to dry. With the third layer dry, everything should look great. You have a final step to perform. While the drywall has filled in all the imperfections, you will want to sand it. If you don't, there will still be some raised bumps from the drywall, or slight shifts in where you applied the compound in sections. To smooth this area out, you'll want to take a 120-grit sand paper and sand the wall. If you have thicker areas where you find valleys and peaks from the application. you'll want to use a 100-grit sandpaper first. The 120-grit is designed to help smooth everything out and give you the polished, finished look. Now, take a damp rag, and wipe down the wall to remove any of the drywall dust that is left from the sanding. Once you're done with this, you can remove the drop cloth (unless you want to paint the drywall, in which case you'll be all ready). Skim coat drywall application is not a difficult process. It is easy to do, and you'll find it allows you to quickly repair cracks in the drywall. It's also a beneficial method for filling in texture on the drywall you no longer want. As long as you follow these skim coat drywall application tips and suggestions you'll have no problem completing your task. Best of all, you'll be able to take advantage of the skim coat drywall application whenever you might need to later on. Hey Buddy!, I found this information for you: "Tips And Ideas For Doing Skim Coat Drywall Application On Your Walls". Here is the website link: https://www.explodedhome.com/skim-coat-drywall-tips/. Thank you.